In this article, Command & Conquer transport hovercraft will be compared to their real life counterparts, air-cushioned landing craft. Only hovercraft used for transporting units will be covered here, not any other hovering vehicle intended for a different role. Hovercraft feature in most C&C games, sometimes going by alternate names. In the first games, the unit had severe engine limitations, so its lack of realism is understandable. In Tiberium Wars, both GDI and Nod had hovercraft, but the Nod variant seems more like a low-altitude water-landing VTOL than a hovercraft. In all cases, the in-game versions are quite a bit smaller than reality, although this was almost certainly both an aesthetic choice, to reduce the clutter a massive vehicle would introduce, as well as unit size limitations. Even small-sized military hovercraft have decent weight capacities. An example of a small hovercraft is the SAH 2200 used by England and Finland. It has a cargo capacity of 2000 kg / 4400 lbs. In general, small hovercraft can transport somewhere around ten troops in addition to their crew. Medium-sized hovercraft are large enough to carry military vehicles. An example of this size is the Russian Lebed-class with a capacity of 36,000 kg / 80,000 lbs, or the Chinese Yuyi-class with a payload capacity of 45,000 kg / 100,000 lbs. The largest-sized hovercraft can carry a number of military vehicles, or even a tank. Notable examples currently in service include the Landing Craft Air Cushioned used by the USA and Japan with a payload capacity of 54,000 kg / 120,000 lbs, and the Russian Aist-class with a payload capacity of 72,500 kg / 160,000 lbs. For a point of reference, Humvees weigh around 2,359–2,676 kg / 5,200–5,900 lbs. In Renegade, Havoc “liberates” a hovercraft and drives it out of the ship. This type of ship would be an amphibious assault ship. The back of the ship has what is called a well dock, which can be flooded to allow boats or hovercraft to enter and exit. 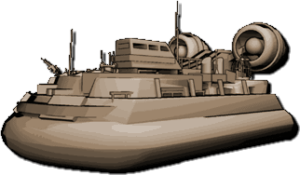 Before picking apart the unrealistic features of C&C hovercraft, note that the nearly universal covered designs seen throughout the series are not necessarily unrealistic, as many real military hovercraft also have covered cargo areas. A minor nitpick to start. 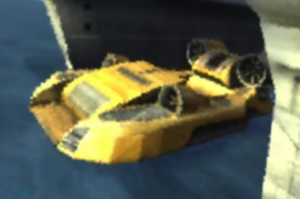 Many of the hovercraft, and unit transports in general, from the C&C games seem to like having a troop capacity of five. This number seems quite low, as mentioned above, small-sized hovercraft usually hold around ten troops. One notable difference between the C&C hovercraft and their real counterparts is that the real ones are generally armed, while the Riptide ACV is the only armed hovercraft in the series. Real air-cushioned landing craft mainly have machine guns or automatic grenade launchers, but may be equipped with some other types of weapons too. The Red Alert 1 Transport and the Tiberian Wars GDI Hovercraft both had sharp angled edges. While it is possible the Tiberium Wars vessel used some new advanced technology, it still appears to feature rubber skirts. Real hovercraft have a round edged design for a reason, this is the most stable and efficient design for the aircushion. Overall, the Red Alert 2 Amphibious Transports look quite nice, but the hover mechanic of RA2 has the unit constantly bouncing up and down, while real hovercraft would maintain a very consistent elevation. Finally, a look at the frightfully unrealistic unit capacity that often seems to defy logic. The RA2 variant will be used as the C&C sample since it has an easy to understand slot system. The Amphibious Transports have 12 cargo slots, infantry other than Brutes take up a single slot each. A Flak Track can load five infantry, but only take up three slots on the Amphibious Transport, which is the same number of slots as the main battle tanks. Now compare the world’s largest military hovercraft, the Russian Zubr-class. It can carry 140 troops, or eight APCs, or three tanks. MCVs are not real, so it is hard to judge their scale, but it is unlikely more than one would be able to fit on any hovercraft much less the two that can fit on the Amphibious Transport.